Chef Charlie Yusta started in the catering business with his company Chefs on the Run, which specializes in high-end catering for star-studded parties and sets. But when the opportunity came to open up a restaurant, he jumped on it, taking the old Iota space in Koreatown and turning it into an oyster and seafood bar called the Horse&apos;s Mouth. Iota, as you may recall, was a great place to get a late-night meal or dessert, but shut down in May after owner Brian Chong decided to move to Texas. Yusta has simplified the space, turning the K-pop cafe into something more subdued and open, with lots of table seating, a spacious bar and, of course, dining al fresco on the established patio. The menu is heavy on the seafood. 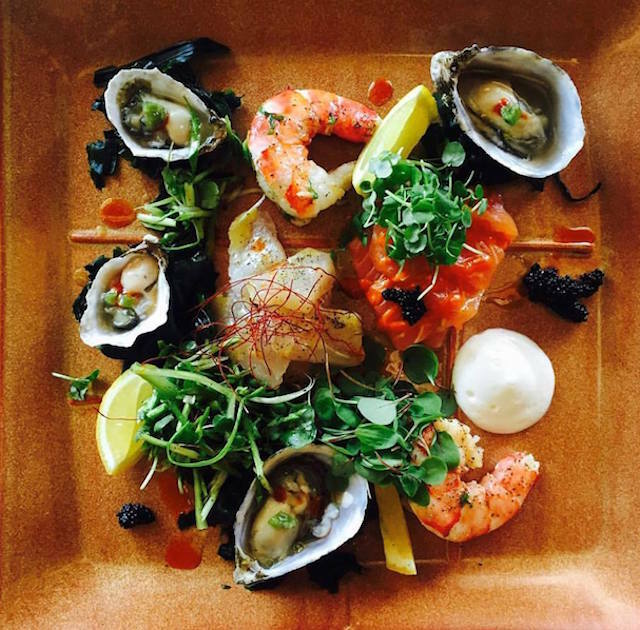 It contains a raw bar section with oysters, sashimi and jumbo shrimp, as well as several cooked shellfish dishes. Most of the items on the menu can be easily split among diners. For instance, there&apos;s the duck, which has been cooked for three and a half hours, resulting in a moist inside and a crispy outside. The meat can be removed from the bone, then wrapped up in a soft moo shu pancake, then dipped in hoisin sauce and mustard. 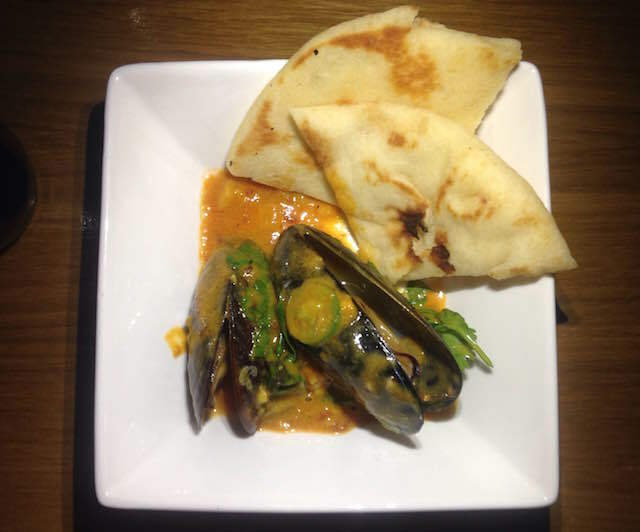 They also have an interesting mussels dish, where Yusta explains they "almost burn" curry and turmeric, then add coconut milk and kaffir lime. The mussels are smothered in this well-spiced combo, and you can eat them with house-baked naan, which is also great for sopping up the leftover sauce. The stand-out item is their whole fish entree, which is a recent addition to the menu. 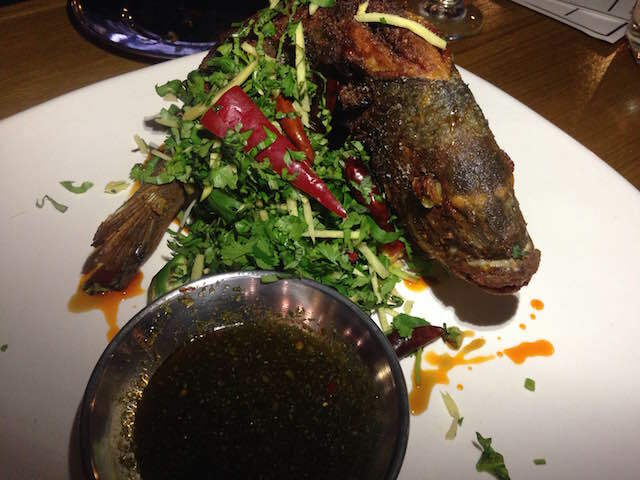 It&apos;s a whole fish, stuffed with ginger, chili and garlic paste, then fried. Much like the duck, the tender meat is removed from the bones by the diner, then combined with fresh herbs and dipped in a spicy Thai sauce. Though it does come as a whole fish, it&apos;s an accessible dish and easy to share. Prices may vary, as the type of fish will change based on whatever&apos;s fresh that day. They&apos;ve also got a crispy chicken skin salad, beef carpaccio, a steak and a burger, which comes topped with bacon jam, cheddar and bleu cheese and spicy relish. At $13, it puts them in the same price range as Little Tart, which opened up in earlier this year on the other side of Wilshire in the former Saint Martha space. For an interesting side, try the ink fries. They&apos;re thick-cut fries made black with squid ink, topped with parmesan, arugula and pepper, and Yusta refers to them as Horse&apos;s Mouth&apos;s poutine. Horse&apos;s Mouth does offer a nice bunapi salad, where the bunapi mushrooms are lightly fried, then paired with greens, garlic aioli, goat cheese foam, parmesan, basil and pumpkin seeds. It is unlikely to fill you up, so best shared alongside an entree with a friend. There&apos;s not a whole lot for vegetarians here, unless you&apos;re just stopping by for some fries and a beer. And speaking of beer, they have a small, but varied list that includes drafts, bottles and cans. The Hitachino, a Japanese craft beer, is particularly good, and they carry a nice porter from Iceland for dark beer fans. They also have a small wine list and a couple sake options. Soon, they plan to start introducing a not-so-secret menu items for late-night hours when the kitchen is otherwise closed. It&apos;ll consist of a spicy oxtail soup in a ginger broth with carrots and celery, combined with a fresh salad. "The reason why we decided to put this amazing soup dish on the menu is to honor my grandma," Yusta said. "She&apos;d to make me this aromatic, gingery, spicy broth…when other chefs and I were out doing a big night gig." Right now, the restaurant is open daily from 6 p.m. to midnight, but they plan to start moving into later hours as traffic increases. From 6 p.m. to 8 p.m. daily, you can score $1 oysters and $5 tallboys of Tiger, a Malaysian lager.